Millions of engaged couples turn to WeddingWire as their trusted wedding resource, with the largest directory of local wedding vendors in Idaho. Easily find the best wedding services in your area with detailed vendor...Read more reviews, prices and availability for your wedding day. Idaho is a beautiful state with various landscapes and multiple attractions. With mountains, rivers, lakes, and hot springs, you're sure to find the perfect venue for your Idaho wedding. For outdoorsy types, Idaho is hard to beat. The Gem State has more whitewater than any other state in the continental U.S., over 20,000 acres of skiable land, and almost every activity you could want in any season. Northern Idaho is lush and green, with lakes, rivers and ski resorts peppered all about the area. Coeur d'Alene, the largest city in northern Idaho, is home to beautiful Lake Coeur d'Alene and the Coeur d'Alene Resort. This beachfront resort offers golf-including the world's only floating green-an award winning spa, and lovely options for an elegant Idaho wedding. If you've chosen a winter wedding, you can hop over to Silver Mountain Resort or Schweitzer Mountain Resort to spend some time on the slopes... or get hitched right on the mountaintop! In southern Idaho, Idaho Falls rests in the Snake River Plain amid the Rocky Mountains. The Tetons provide a lovely backdrop for a stroll along the Snake River Greenbelt. The Idaho Falls Greenbelt Loop-where you can explore a Japanese Garden, waterfalls, and Sportsman Park-is ideal for an intimate wedding. Ten miles north in Rigby, you'll find the idyllic Loft Reception Center. 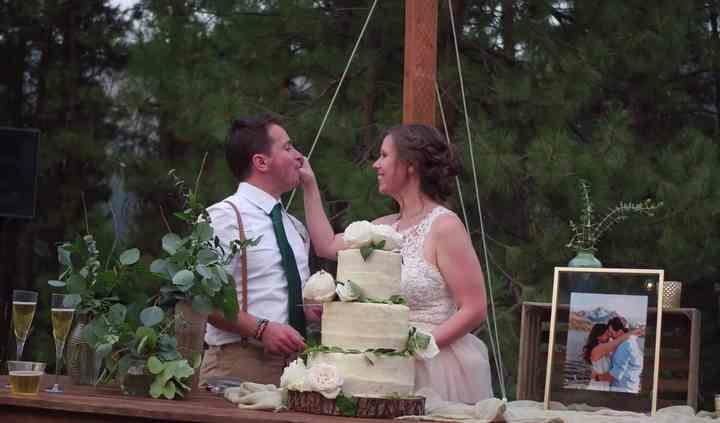 Featuring three acres of land and gardens and the stunning main log building, this venue is one of the biggest reception centers available in southeast Idaho. Boise, Idaho's state capital, is the largest city in Idaho and offers arts, culture, and history. There are wedding venues galore, from traditional to eccentric. You can get married at the Boise Art Museum, among world-class sculptures, or you can go with an unconventional locale and wed at the Knitting Factory, a concert house that's also available for your Idaho wedding. There's no shortage of options for a wedding in Idaho, and you're guaranteed to find the venue of your dreams. The weather in Idaho varies dramatically, much like its landscape. There are six different climate classifications within the state, so depending your elevation and location, you may be in a desert climate or a temperate continental climate. Regardless, temperatures are fairly predictable in Idaho, and generally summers are hot and dry, while winters are cold and snowy. Plan your wedding décor according to your locale and season. A winter wedding at a ski resort calls for laid-back luxury. Use decorated branches in beautiful pottery for centerpieces and use swaths of faux fur as runners for a luxe flair. A summer wedding by the water requires a light touch. Play on the state's nickname-the Gem State-and use crystals and geodes as decoration around the room. Bowls of rock sugar or vases of rock candy add a quirky touch. Incorporate coordinating satins to continue the ornate feel. The first thing that probably comes to mind when you think about Idaho is the potato, and while potatoes are delectable, there's much more to Idaho cuisine than that. With so many rivers and lakes crisscrossing the state, the rainbow trout is plentiful and flavorful. Huckleberries are also a regional favorite, and can be found in syrups, ice cream, chocolate, or sprinkled on just about anything. Idahoans love a good meal, so make sure you plan your menu accordingly. An Idaho catering company can help you choose the right menu for your budget. But don't forget about the music! Your wedding needs the right soundtrack to keep the celebratory mood going into the night. Find the right Idaho DJ who can combine your personal tastes with classics that will keep your guests on their feet. Idaho is a big state-approximately 83,557 miles-and unless you're flying in to Boise Airport, you'll be traveling by bus or car. You may want some help as you travel, so check out one of the visitor centers throughout the state to get helpful information during your trip. Costs in Idaho are relatively low, so travel-and your wedding-costs less than you think. The average wedding in Idaho comes in at nearly $15,000 less than the national average. The cost of a marriage license is around $30 in Idaho, but varies from county to county and most counties require payment in cash. Bring your birth certificate, a government issued ID, and your Social Security number. Idaho does require that you read and sign an AIDS education sheet, but you'll receive your marriage license the same day and there is no waiting period. Your license does not expire.